This letter from Kansas Senator Cylde Reed to Dr. D.L. Stewart concerns the segregation of blood based on race. Reed states, "It may well be true that there is no chemical or physical differences. I think that is conceded. Prejudice, however, sometimes is a more formidable obstacle than facts." 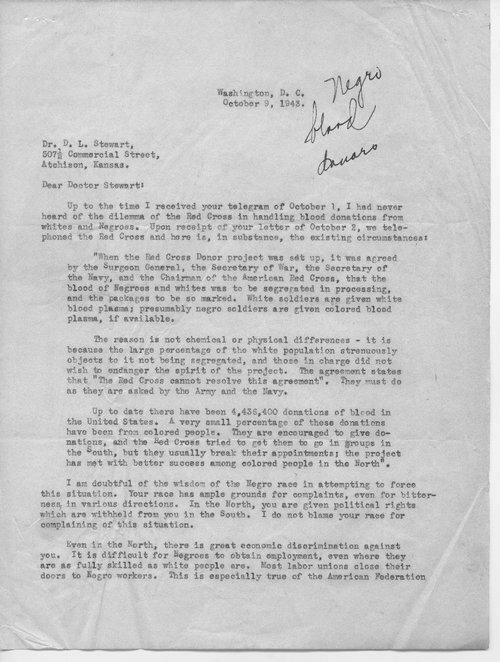 This item can be used in conjunction with other materials on race and ethnic relations during the World War II-era as it covers the segregation of blood based simply on race.